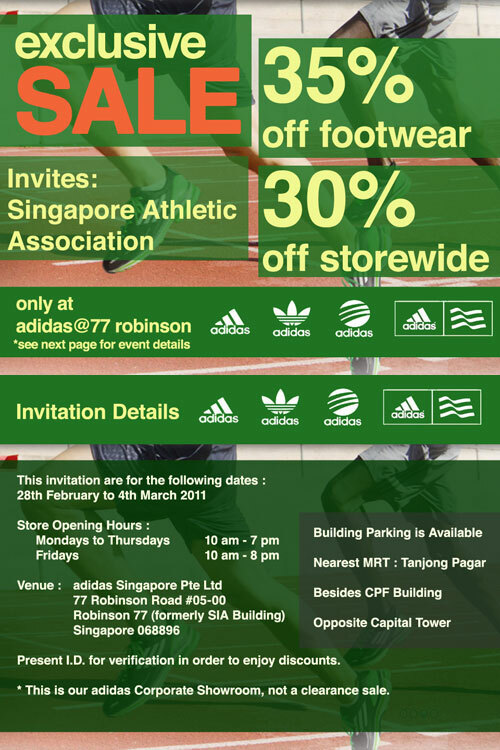 Singapore Athletic Association has collaborate with adidas to offer exclusive sale invitation to SAA Track & Field Series 2 participants only! This invitation is only valid between 28th February to 4th March 2011. This is not a clearance sale. Step 1 – Visit the Adidas at 77 Robinson Road outlet. This exclusive SAA adidas sale invitation is offered at this adidas corporate showroom only. Step 2 – Inform the salesperson you’re a SAA Track & Field Series 2 participant. Step 3 – Please present your identification card for verification. Any queries can be forwarded to SAA or call +65-63862721.